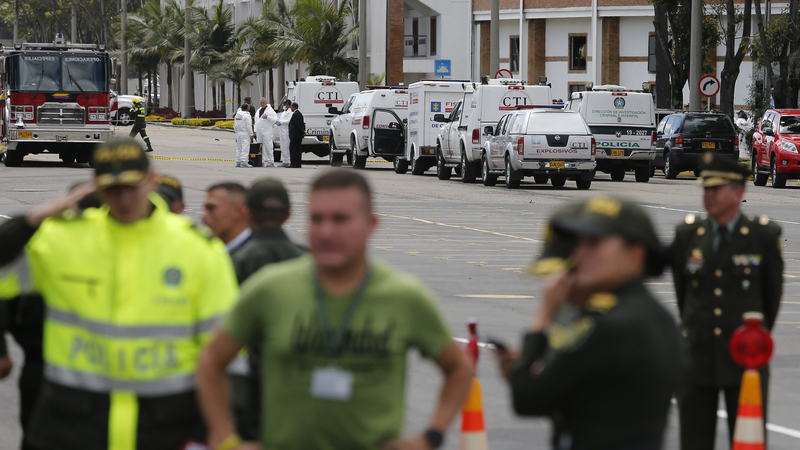 At least nine people were killed and dozens injured in a car bomb blast at a police academy in Colombia's capital, Bogotá, on Thursday morning, according to officials. They called it a terrorist act. No group immediately claimed responsibility, but the attack stoked anxiety about a return to the decades when innocent Colombians got caught up in conflicts with rebel groups and drug cartels. Chaos pierced the calm Thursday when a man drove up to the gates of the Escuela General Santander around 9:30 a.m., according to local news reports. He accelerated, crashing into a wall. Then the explosion went off. Chief Prosecutor Néstor Martínez said the motorist's name was José Aldemar Rojas, according to the Associated Press. He was driving a 1993 Nissan pickup loaded with 175 pounds of pentolite, a highly explosive material. Citing an emergency, city officials appealed to the public to donate blood to victims of the explosion. Thursday's explosion derailed a tenuous feeling of peace the city has enjoyed in recent years. "Over recent decades, there were many bombings in Colombia because of the conflict between the government and leftist guerrilla groups and drug cartels," reports NPR's Philip Reeves. "These tapered off after the largest rebel group FARC signed a peace agreement in 2016. But peace negotiations are stalled with one insurgent organization, the National Liberation Army, and it continues to carry out occasional attacks."